DEMO DISCOUNT!!! SPRING CLEANING BLOWOUT!!! 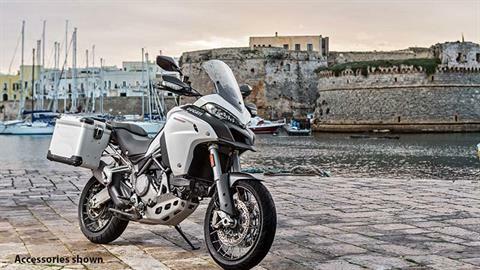 The Multistrada 950 combines the kind of riding excitement that only a Ducati can offer with extraordinary versatility, making it the ideal bike for all types of use, at any time of day. 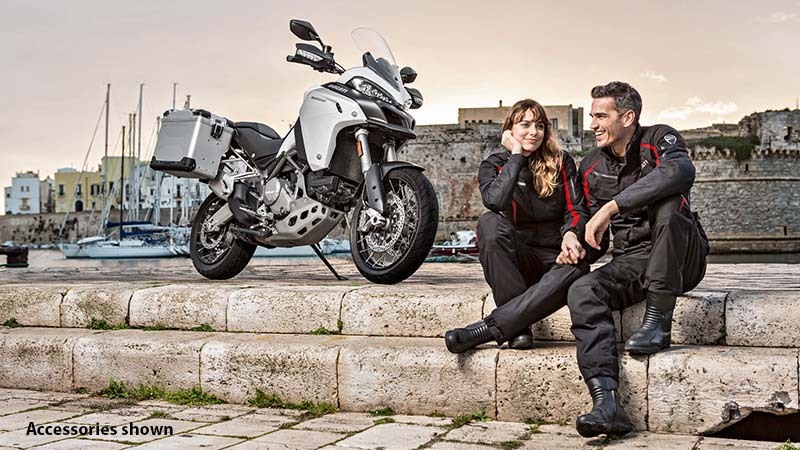 TIRES AND RIMS: The Multistrada 950 is equipped with alloy rims on which are mounted Pirelli SCORPION Trail II tyres in sizes 120/70 R19 at the front and 170/60 R17 at the rear. SCORPION Trail II. This tyre represents the meeting of two paths: off-road racetracks and touring roads. Created for the most demanding of bikers, its strengths include high mileage, consistent performance over its entire life cycle and first-rate behaviour in wet conditions. LIGHTS AND INDICATORS: The Multistrada 950 is equipped with a front headlight with an aggressive and technological design, typical of bikes in the Multistrada family. At the rear is a LED light. 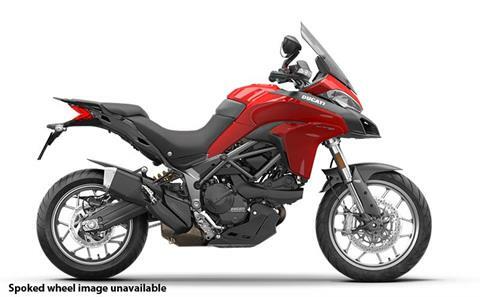 The Multistrada 950 also boasts the hazard light function, activated by pressing the dedicated button. TESTASTRETTA 11°: The Multistrada 950 is powered by the already renowned twin cylinder 937 cm3 Testastretta 11°, now extensively overhauled. EURO 4-rated, it has four valves per cylinder, liquid cooling and bore and stroke measurements of 94 and 67.5 mm respectively. Engine power amounts to a maximum of 113 hp* at 9,000 rpm and a maximum torque of 96.2 Nm at 7,750 rpm. The compression ratio is 12.6:1. NEW CYLINDER HEADS: The twin cylinder Testastretta 11° engine on the Multistrada 950 features two new cylinder heads with a redesigned oil circuit and secondary air intake ducts on the covers. The Multistrada 950 gulps in the fuel mix through new 53 mm cylindrical-section throttle bodies controlled by an advanced Ride-by-Wire system. Moreover, this engine also features a new control unit and electronic injection system. The exhaust system is of the 2-1-2 type with lateral silencer. EXHAUST SYSTEM: The exhaust system layout is based on two primary manifolds that merge directly in the single 2-chamber silencer; the latter, in addition to acting as a 2-1-2 collector, contains the catalytic converter. From here two pipes exit directly towards the light, compact silencers, which are side-mounted in a high position and feature aluminium alloy outer sleeves. 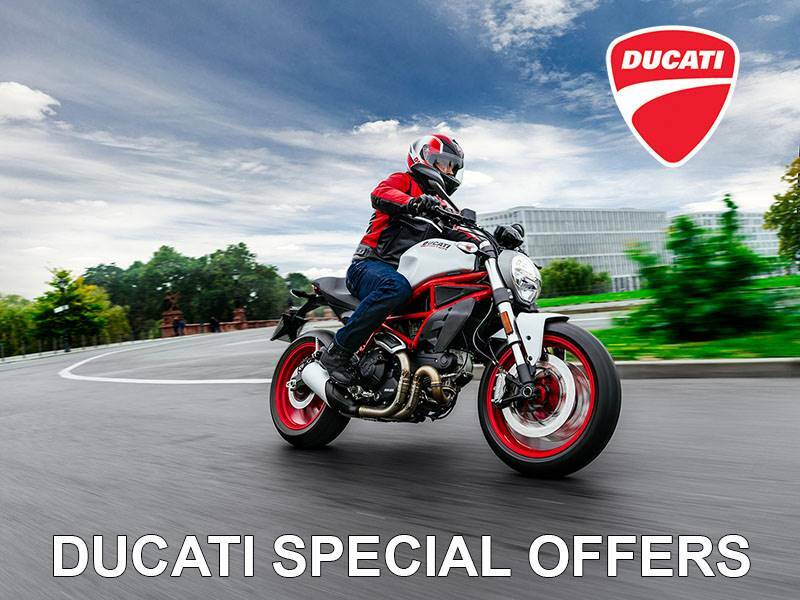 DUCATI SAFETY PACK (DSP): The Multistrada 950 is equipped with a DSP (Ducati Safety Pack) that includes ABS and Ducati Traction Control, enhancing bike performance, optimising control and boosting safety levels. This package is managed via four different Riding Modes, each of which (Sport, Touring, Urban and Enduro) gives the Multistrada 950 a distinctive personality thanks to different ABS and DTC (Ducati Traction Control) settings. BOSCH ABS SYSTEM: Multistrada 950 standard equipment includes a Brembo braking system with ABS, controlled by the Bosch 9.1 MP control unit with integrated pressure sensor, which is part of the Ducati Safety Pack (DSP). The 3-level system ensures short stopping distances and stability whatever the riding conditions thanks to full integration with Riding Modes. RIDING MODE: Ducati Riding Modes, first introduced on the Multistrada in 2010, let riders select different pre-set modes that optimise bike behaviour according to their individual riding styles and road conditions. 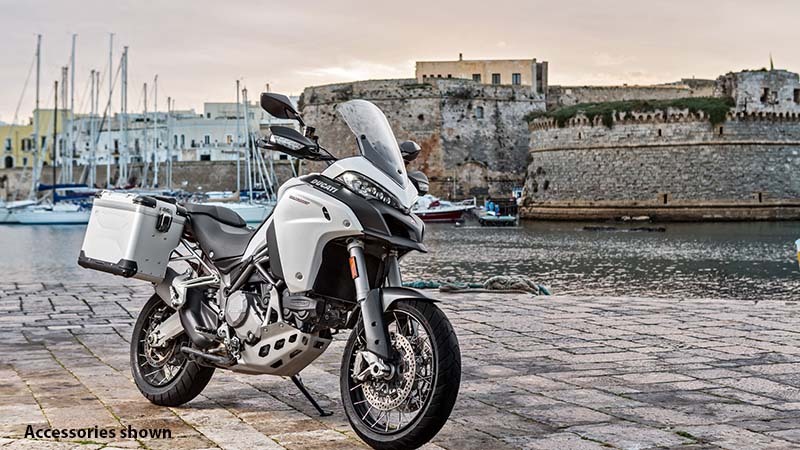 The Multistrada 950 has four Riding Modes (Sport, Touring, Urban and Enduro), each programmed to act on the electronic Ride-by-Wire (RbW) engine control system and the ABS and DTC levels. The available modes stem from a combination of cutting-edge dedicated technologies. LCD INSTRUMENTATION: The Multistrada 950 instrument panel consists of a large easy-to-see LCD that provides the rider with primary and secondary information. The unit gives info on speed, rpm, total distance ridden, selected gear, trip1 and trip2, engine coolant temperature, fuel level and, of course, a clock. And that's not all: the display shows the selected Riding Mode, miles remaining, real-time fuel consumption, average fuel consumption, average speed, air temperature, travel time and road ice warning. Price, if shown and unless otherwise noted, represents the dealer unit price and does not include government fees, taxes, dealer vehicle freight/preparation, dealer document preparation charges, labor, installation, or any finance charges (if applicable). Final sales price will vary depending on options or accessories selected; contact dealer for more details.